If you have lively children with lots of energy to burn off, it can be tricky keeping them calm and happy on a wet day. They probably grow restless watching TV or playing computer games and need to move around and stretch their legs. But it can be hard for moms and dads to think up suitable entertainments on the spur of the moment, so here are seven cost-free activities to run for them as the rain streams down the windows. They’ll need a little organising and supervision, so leave the washing-up and the laptop and make it a special, family day. They’ll relish your company! Gather some wrapped sweets, chocolates or cookies – at least two per child – and hide them around your rooms. Don’t conceal them too thoroughly, though, or your children may grow frustrated and give up searching. Add extra excitement by leaving clues, such as arrows, smiley faces, and messages. Tell each child to seek a set number of items, and encourage older ones to help younger siblings. When every item has been found, suggest they make their own treasure hunt. Perhaps it’ll be for you. Push your furniture to the sides of your play area, clear clutter from the floor and remove fragile ornaments. You can now set the ball rolling – literally – for indoor sport. You’ll need two soft balls and a team, or child, each end of the room. See who can roll their ball to the other end first. Now put an obstacle in the way, such as a cushion or footstool. Who can get their ball around that? Now see what challenges your kids can invent – through their giggles. Play some rhythmic music and lead your children through various keep-fit exercises or floor-based gymnastics. Actions could include sit-ups, arm swings and lying on the floor with legs raised, pedalling the air. Ask the kids for ideas, too. They might suggest a somersault, jumps or walking on hands and knees. For a fun finish, they could impersonate animals for the rest to identify. What will yours be? Dig out some old clothes, such as hats, party shoes, aprons and shawls, for your kids to dress up in, adding any costume jewelry and sturdy accessories you can find. Suggest they use their outfits to represent characters and act out a story. Perhaps one will be a princess and another a ghost or witch. What happens? Do they meet up for tea, or does a monster shoo them away? You can be the audience, offering prompts along the way and applauding at the end. Bring some materials into your play area and let the children make a den with them. Fabrics might include a tablecloth, duvet cover, and cardboard box. Available furniture can provide the structure and a torch will serve for interior lighting. How about some pretend food for a picnic? Teddies might like to join in, too. If ideas run dry, suggest the den turns into a submarine or shop. You may find housework boring, but your children will probably enjoy it as a novelty. Let them sweep the floor, polish the table or vacuum the carpet. If they can reach, they’ll enjoy shining up a basin or washing the dishes with you. Try to bear messes patiently and show gratitude for their efforts. Children love to please their parents. However heavy the rain, a breath of fresh air and a leg-stretch can be enjoyable. It can also burn off energy and release tension. 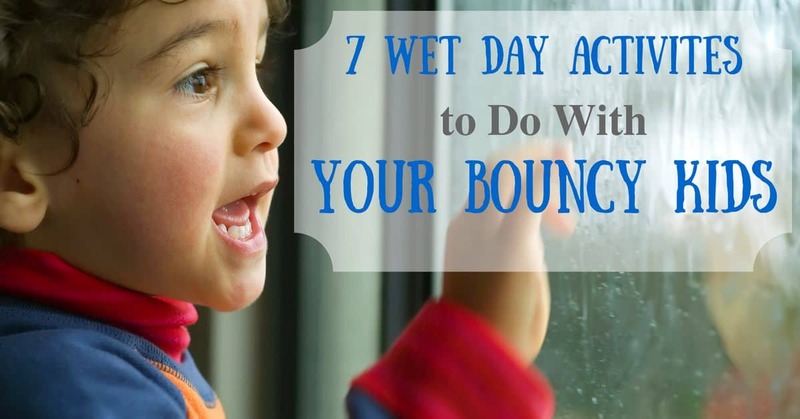 Help your kids wrap up in waterproofs and set off for a splashy walk. Take a ball and head to the park, or provide bags for collecting interesting items, such as fallen leaves, pebbles, and feathers. Sing a song between your puddle-jumps. Who can make the biggest splash? Keep your home as fresh as possible while you’re all indoors, opening a few windows, if necessary. Fresh, cool air helps keep tempers cool. When your kids have had enough jumping about, put some paper and crayons on the table and let them have a good old scribble. Wet days can be wonderful fun, even for Mom and Dad!